In a new study evolutionary biologists reveal that bird beaks are the result of skeletal changes controlled by two genetic pathways, shedding light on the origins of one of nature’s most efficient tools. Birds are among the most successful creatures on the planet, with more than 10,000 species living across the globe, occupying a dizzying array of niches and eating everything from large animals to hard-to-open nuts and seeds. Part of the key to that success, scientists say, might be right in front of their faces. Led by Arkhat Abzhanov, a former associate professor of organismic and evolutionary biology, a team of researchers has shown that bird beaks are the result of skeletal changes controlled by two genetic pathways, shedding light on the origins of one of nature’s most efficient tools. The study was described in a paper published earlier this year in the journal Evolution. The first step toward answers, Abzhanov said, was to clarify why birds have beaks at all. “The immediate ancestors of birds had very long fingers and a somewhat opposable thumb,” he said. “It’s believed they could use their hands to build nests and manipulate small prey … and that’s exactly what birds lost when they evolved wings — those fingers became bones in the wing. So once birds lost them, they replaced them with a finger on their face — the beak. To get an up-close-and-personal view of how developmental patterns reveal the evolution of birds, Abzhanov and colleagues turned to their closest living relative — the alligator, a crocodilian. “Because we can get live alligator embryos with snouts, we can actually compare them with beaked modern birds to see how they develop their faces, and what genes are activating during that process,” Abzhanov said. The team discovered two genetic pathways, both of which are present in virtually all vertebrates, but which work differently in the development of bird faces. These signaling pathways, FGF8 and WNT, tell cells how to proliferate and differentiate, and in land vertebrates are normally expressed in two regions, around the left and right nasal pits. In birds, however, expression also occurs in the middle of the face, causing the two regions to fuse to produce a single beak bone instead of paired facial bones. 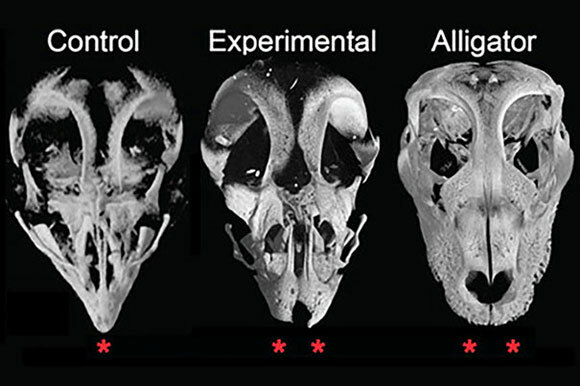 For insight into beak development, Abzhanov and colleagues interrupted the pathways in chickens, producing embryos with facial bones that looked remarkably like their snouted dinosaur ancestors. The results of the study, he said, indicate that beaks did not emerge fully formed, but developed gradually through intermediate shape changes, some of which are yet to be found in the fossil record. Be the first to comment on "How Birds Got Their Beaks"